All shipping is approximately 4 weeks from ordering. Samples are included in every order. For orders over 6 tarts, we recommend selecting a box option for shipping to protect your order. 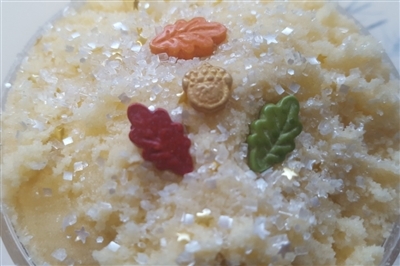 An 8 ounce creamy sugar scrub with added shea oil. Ylang ylang essential oil, violet leaf, and vanilla blossoms. Tetrasodium EDTA,Fragrance, Essential Oils, Mica, Titanium Dioxide, Tin Oxide, and Candy Sprinkles.